As part of the Queens Wharf Redevelopment project, the Auckland Waterfront Development Agency worked with one of the largest professional services consultancies in the Asia Pacific, Beca, to redevelop Shed 10 among other waterfront structures. Once a double-storied cargo shed, Shed 10 was adapted for re-use in time for the Rugby World Cup and then underwent further refurbishment to become Auckland’s primary cruise ship terminal and an events venue. This phase of the project posed two particular structural challenges that required accurate modelling of the vibration performance of the structure. The first structural challenge that Beca faced during the project was the introduction of a new stair case that was to provide both primary access to the upper floor and also provide a key fire egress route. As a result, this called for a relatively wide stair (3m) to allow for the movement of a large volume of people. 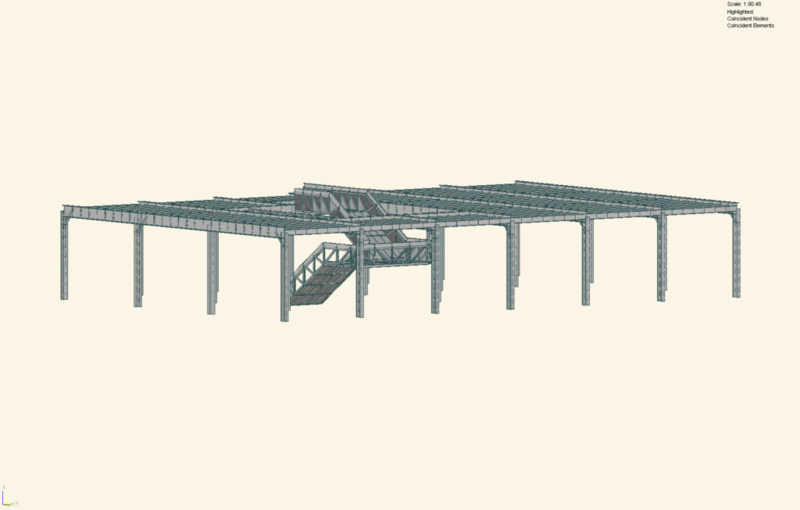 This was further complicated by a requirement for the stair to span 12 metres to a hanger system suspended from a new 12 metre span beam as no new columns were allowed on the wharf deck below. Due to the potential for large cumulative deflections of this combined system, steel truss stringers were required to be concealed in the solid clad balustrades. The second unique challenge of the project was the prior removal of a line of internal columns within Shed 10 that formed a very long beam span of 16 metres on the eastern side of level 1. As a result of the column removal, the floor would be significantly livelier on this side compared to the west. A preliminary 3D dynamic analysis of the floor under footfall (walking) excitation was undertaken which predicted accelerations in this area. Options for mitigation were then explored. Aaron Beer, Technical Director at Beca explained the complexity of the project and its requirements: “our experience of stairs and floors of this type is there can be a risk of excessive liveliness which is a potential concern in terms of satisfying industry standard comfort criteria”. 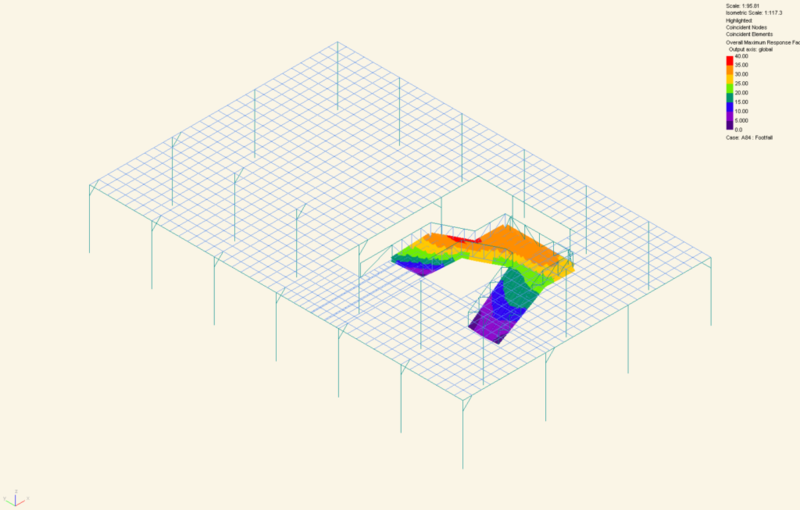 Used to its strengths, GSA footfall analysis enables users to locate regions of high and low response and thus to explore localised modifications to floor structures to minimise cost. 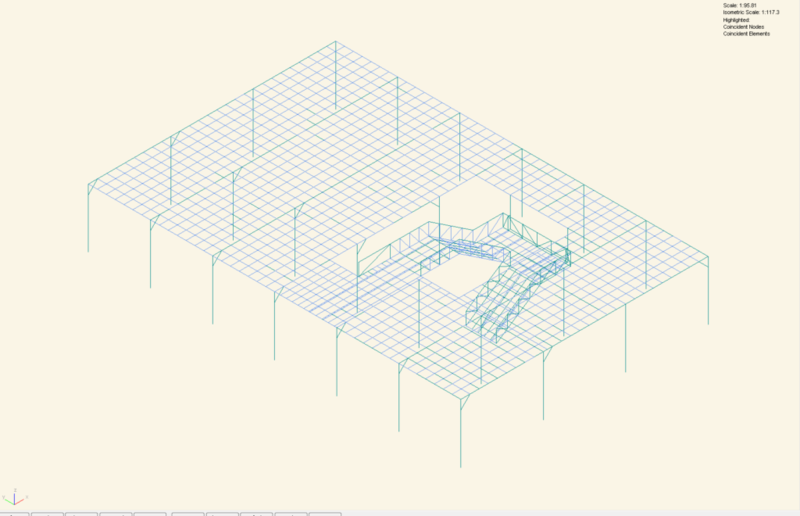 GSA provides designers a powerful tool to assess structures using the SCI, Concrete Centre and Arup methods. The development project was completed and welcomes over 100 cruises and 200,000 visitors to Queen’s Wharf, a public space for citizens and a gateway for visitors to Auckland, every year. Shed 10 and the Wharf are registered as a Category 1 Historic Place, which is the highest level of heritage status and protection.